The use of cloud applications can be measured in different ways. One way is to look into the degree of penetration; which part of the business sites uses applications from the cloud? The figure seems to be 56% of Belgian business sites at this time. Another way of calculating is to look into which part of all applications is a cloud solution. With the latter method, it would appear that one out of seven applications in use at present (14%) runs on the cloud. Four years ago, that figure was just 10% and two years ago 11%. The most important outlier seems to be the government sector. In this segment, cloud applications account for 41% of the applications mapped. For all other branches, this percentage (of cloud applications) is still only 7%. Another remarkable difference comes to the fore by segmentation per region. 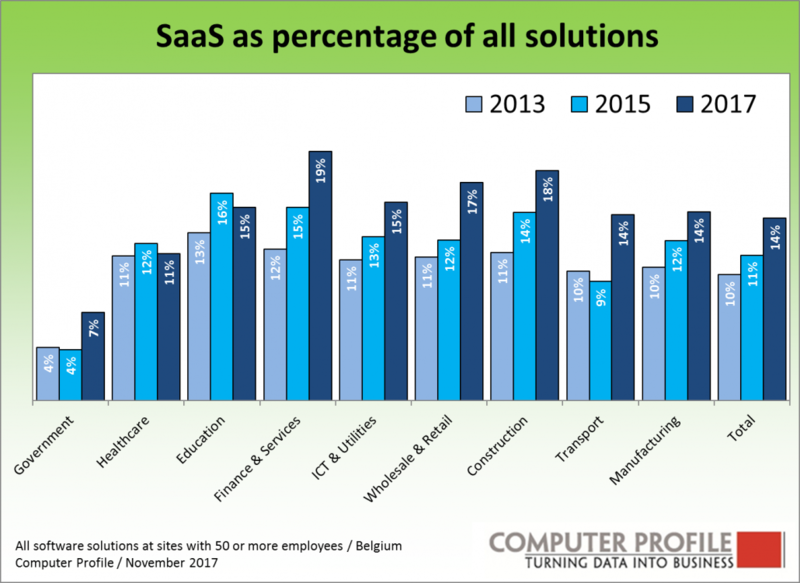 In the Brussels-Capital Region, cloud applications constitute 13% of the inventoried solutions. In Wallonia, this figure is currently 6%, while in Flanders, cloud applications constitute 16% of the total. This is shown by analysis by Computer Profile based on interviews with nearly 3,000 Belgian commercial and public sites with 50 or more employees. In addition to the growth in cloud applications as a percentage of all applications, the percentage of sites where cloud applications are used is also growing constantly. In 2013, 49% of the interviewed target group indicated that they used one or more cloud applications. That figure was 52% two years ago, and 56% in 2017. We see major differences also in the penetration rate at site level between the regions. 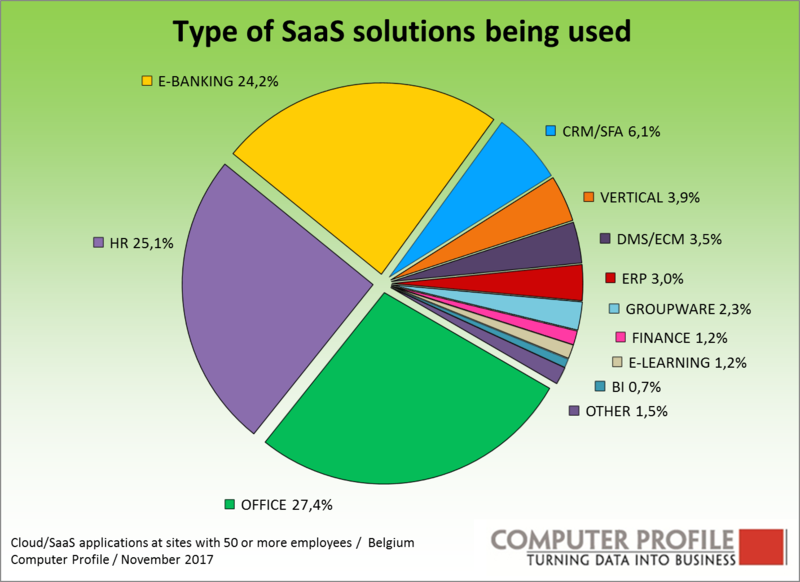 In Flanders, 64% of the locations can run one or more cloud applciations; that figure is 54% of the locations in the Brussels-Capital Region, and 30% in Wallonia. The Flemish business market is very much similar to its Dutch counterpart, where a comparable analysis has been conducted. For the Dutch business market, the percentage of locations with cloud solutions is 63%, and 19% of the applications mapped are a cloud application. The survey gauged whether a public, hosted or private cloud solution was used per application inventoried by Smart Profile, or whether the application was still run on the premises within its own organization. 21,000 applications in all were mapped among the 2,900 sites interviewed. Some 1,620 sites indicated that they use cloud solutions (56%). A total of 2,900 inventoried applications run on the cloud (14% of the total). The largest group (27%) within these 2,900 cloud applications consists of Office applications. HR(M) applications account for a quarter of all cloud applications, and an equal portion consists of e-banking applications. All other segments each account for less than 10% of the total. The number of solutions running in the cloud has doubled in the last five years. This growth is in large measure driven by the increasing use of Office applications, HR applications, CRM solutions and document management systems in the cloud. The increasing use of these segments in turn accounts for a sizable portion of the cloud propositions from Microsoft. We naturally see a high correlation of cloud solutions with the aforementioned segments in the inventoried cloud applications. Microsoft is the most commonly cited supplier of cloud solutions for the Belgian business market. Nearly one third of the cloud applications encountered is a Microsoft product. Microsoft therfore has several irons in the fire when it comes to cloud solutions. Office 365 installations have registered enormous growth in the last couple of years. In addition, the use of SharePoint and Exchange in the cloud has gone up. 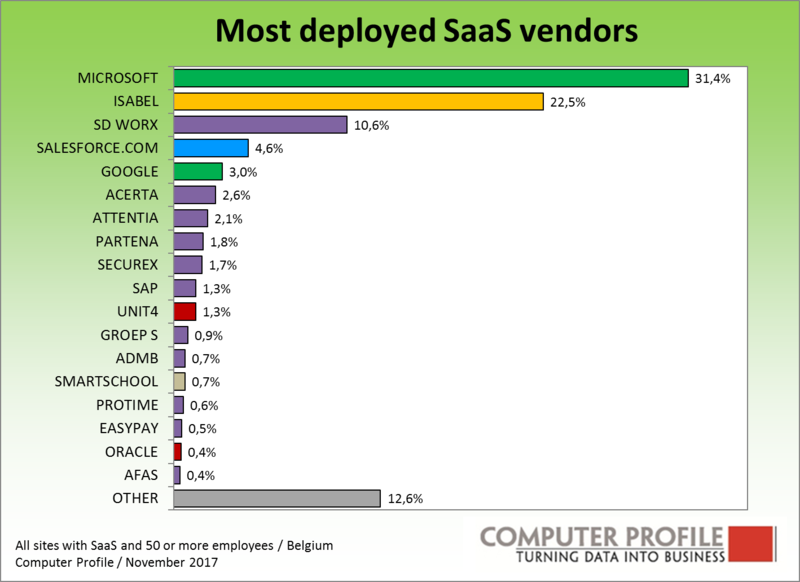 Isabel is the second most cited vendor of Belgian cloud solutions. This concerns the e-banking software from this vendor which is in use in a large number of Begian business sites (in most cases the online version). HR solutions have been an important driving force behind cloud acceptance for a long time. SD Worx is the most cited party for the Belgian business market. About 11% of the cloud solutions encountered is an SD Worx application. Salesforce.com ranks number four among cloud vendors. Although they offer solutions for service, marketing and a development environment, alongside the well-known CRM application, the observed use on the Belgian market concerns chiefly CRM applications. All other vendors have a share smaller than 5% of the total, mainly vendors in the HR(M) software field.